We're completely upgrading the way we approach stress testing. Scenarios is our brand new feature that takes our current stress testing methods to the next level. And a customer preview is available to all Riskalyze users today. 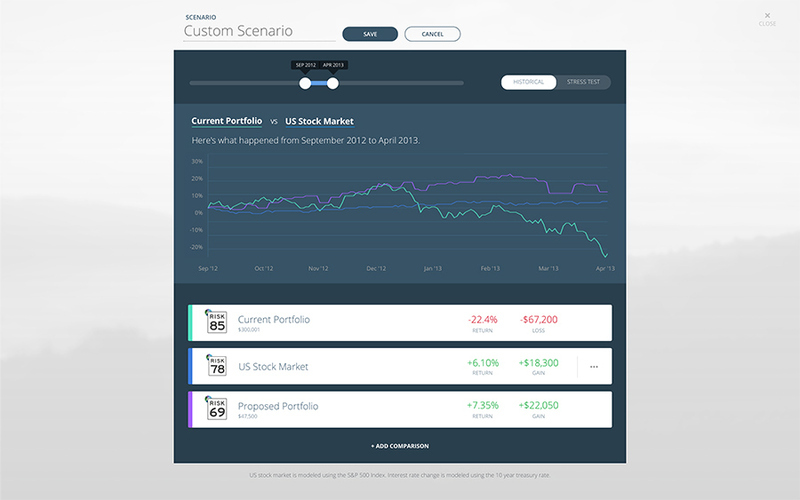 With Scenarios, you can run any of your client’s portfolios through a market timeline, and compare them to just the right benchmark to make your point. You've always been able to demonstrate in Riskalyze how a client's portfolio would have performed during specific market events, but now you can string these events together to create a portfolio narrative that settles the question once and for all... "Why is the market beating my portfolio?" Scenarios empowers you to set far better client expectations. For example, seeing how a portfolio would have performed in the 2013 Bull Market is a great stress test, but it doesn't tell the whole story. With Scenarios, you can now show the two bear markets a portfolio had to go through before reaching the gains of 2013, and display those findings to clients beautifully in Riskalyze. You can create scenarios historically using a date range or create custom scenarios with clients in mind. Have a client looking to invest heavily in energy stocks? Create a custom scenario showing the last time energy stocks fell to demonstrate the risks associated with having a concentrated position. Is your client looking to add Apple stocks to capitalize on the iPhone X announcement? Create a scenario that demonstrates Apple's historical performance and what your client stands to gain (or lose) using real data. Scenarios allows you to save a variety of different contexts you’d like to highlight for your clients and compare them to your suggestions, Risk Number models, and custom market events. What scenarios would you like to have at your fingertips to empower your clients to invest fearlessly? With Scenarios, we've made the solution easier than ever before. Have questions about how you can best utilize Scenarios? Check out our knowledge base article or reach out to the industry's best support team at support@riskalyze.com. Note: Customer preview includes an upgrade to our Stress Test feature and a new Historical Performance scenario. Adding multiple portfolio comparisons and creating Custom Scenarios will be released in all accounts later this month.